The Province of Ontario is investing additional funds towards the ongoing revitalization of Toronto’s iconic Massey Hall. Designated a National Historic Site in 1981, the Sidney Badgley-designed Massey Hall was opened in 1894, and has continuously served as one of downtown Toronto’s foremost venues in the 123 years since. Inspired by Spain’s Alhambra Palace and Louis Sullivan’s Chicago Auditorium, Massey Hall’s Moorish Revival interior had been partially renovated throughout the 20th century. However, the piecemeal nature of the renovations gradually compromised the architectural quality of the interior, which eventually bore little of its former opulence as the space deteriorated. Earlier this month, Eleanor McMahon, Minister of Tourism, Culture and Sport, and Charles Sousa, Minister of Finance, were joined by JUNO award-winning band July Talk at Massey Hall this morning to announce the new Provincial funds.The province previously provided support for Massey Hall renovations, including the construction of a foundation for the new south tower. 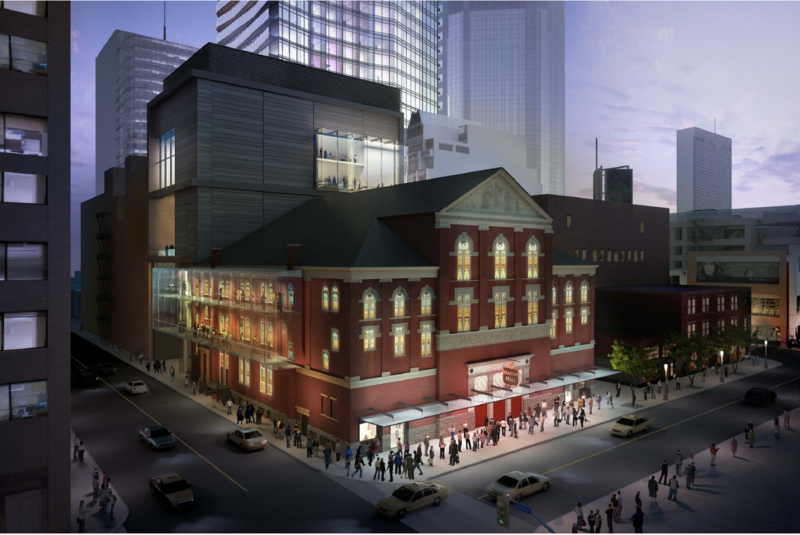 The first phase of work kicked off in 2013, when the Albert Building, a 1917 addition at Massey Hall’s south end, was demolished to make way for a new annex. In the years since, work on the below-grade levels — also supported by a provincial grant — has proceeded. The new funding will help support the revitalization project’s second phase, which will include interior renovations, as well a a new KPMB-designed addition that will occupy the footprint of the former Albert Building.